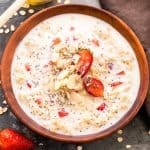 Healthy strawberries and cream breakfast oatmeal that is insanely delicious and tastes like your favourite cake, frosting and cupcake – all rolled into one! YUM! I don’t know whats with me trying to convert oatmeal and breakfast into my favourite dessert. Remember apple pie oats and apple pie granola? But breakfast should be our special meal right? I mean we are all breakfast lovers here. So no compromises. I know how some of you feel about having oats for breakfast. Gloopy, gooey, mushy and did I hear yuck? But does that not look almost as perfect as your favourite strawberries and cream cake? Or as creamy as your favourite strawberries and cream ice cream? 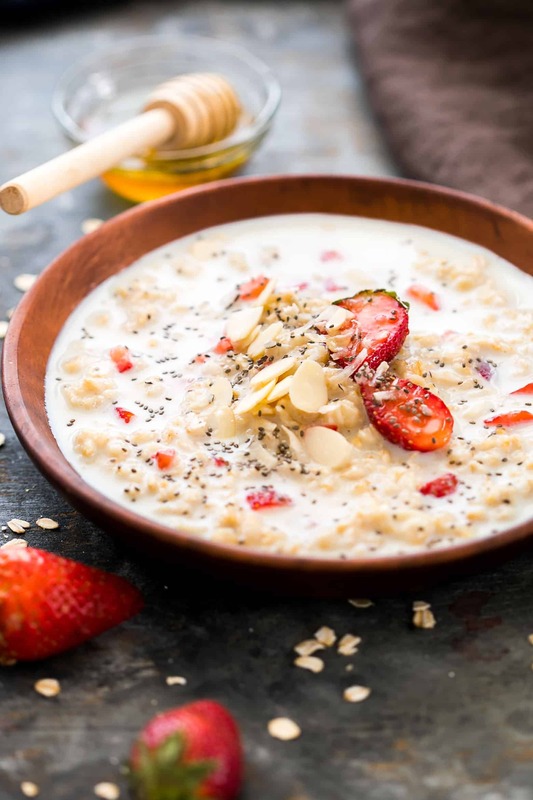 We are talking some insanely delicious breakfast flavours with this healthy strawberries and cream breakfast oatmeal. Since strawberry season hit us, this has been breakfast three days a week. On all the other days, I’ve been drinking copious amounts of butterbeer latte between bites of Oatmeal Banana Chocolate Chip Muffins! Not bad huh? That’s the amazing food blogger life. At least I always have good food around me. But let’s just talk about my strawberry obsession for a minute. Between the sister and I we get through two boxes of strawberries a day. We are in love with everything strawberries and I have one more recipe coming up for you in just a minute. 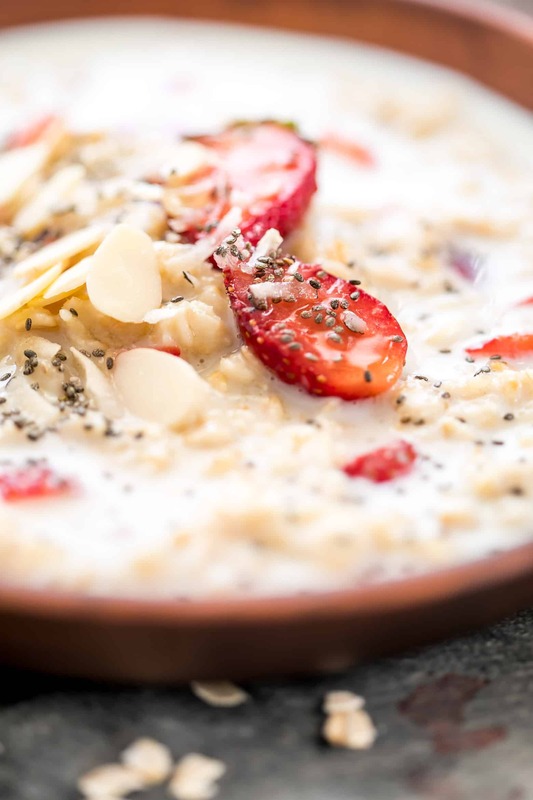 It’s my favourite so far, and is also sort of strawberries and cream, just like this oatmeal bowl. But better, because dessert. Just to clarify, there is no actual cream here. Of course not. We are still trying to stay healthy. And let’s not veer off. Because this year we must stick to the resolutions we made. But it’s the same taste. The same creamy, berry flavour that we all like so much. 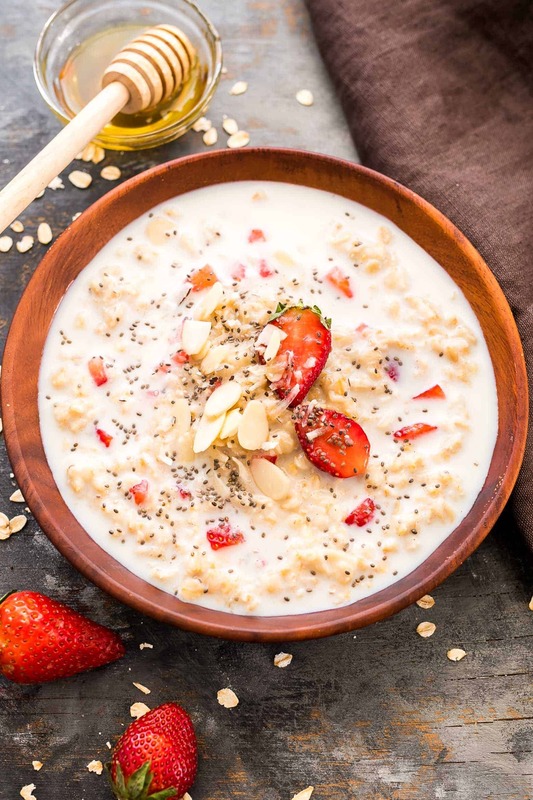 And topped with lots of almonds, coconut, chia seeds and a drizzle of honey this healthy strawberries and cream breakfast oatmeal is perfect. 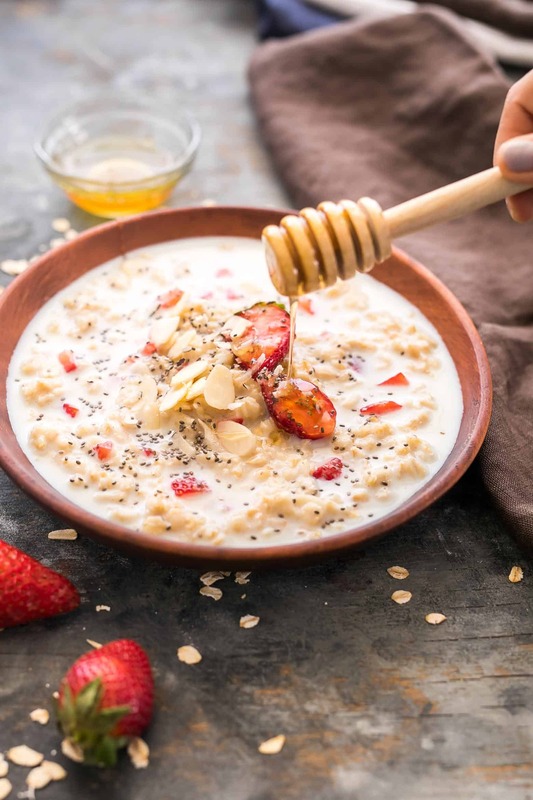 Add oats, milk, vanilla and honey to a pan and bring it to a quick boil. Lower the flame and add strawberries. Simmer for 2-3 minutes till the oats are cooked through. Serve warm topped with your favourites!